Some six months after it closed its doors Nairn’s Woolworth’s shop has new tenants in the form of Wildday.com. Nairnites flooded through the doors yesterday to browse and have a look around the old store. 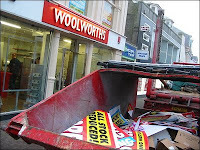 Wildday only have a 10 day tenancy on the property so the opening is short lived, however, an unconfirmed report suggests that the store will soon be opening on a more permanent basis selling Woolworth’s type goods.